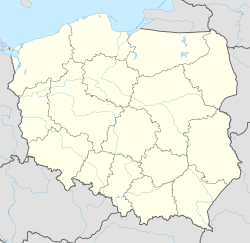 Krapkowice [krapkɔˈvʲit͡sɛ] ( listen) (German: Krappitz) is a town in south-western Poland with 17,840 inhabitants (2007), situated in the Opole Voivodeship, straddling both banks of the Oder River at the point where it joins with the Osobłoga. It is the regional capital of Krapkowice County. Traditionally this Upper Silesian town was a centre for leather, paper and cement manufacturing. Today only the paper and leather industries remain. This Opole Voivodeship location article is a stub. You can help Wikipedia by expanding it.